During the civil war, the risk of lethal infection drove surgeons to perform multiple amputations on wounded soldiers. The loss of life from the infection outweighed the loss of the limb. In modern medicine, the occurrence of amputations is much less due to the development of sterile surgical techniques, but a type of “amputation” is still the only treatment option for many patients battling infection. In modern medicine, numerous implants have been developed to treat many different ailments ranging from basic hernia, to pacemakers, to neuronal implants to control seizures. These implants play a vital role in the restoration of function or quality of life for these patients. However, if an infection grows on the implant despite sterile surgical techniques, then the only treatment option is to remove and replace the infected implant with a new device. The bacteria responsible for the infection protect themselves by forming a biofilm on the surface of the implant. Bacteria in the biofilm are protected from antibiotics and the administration of antibiotics can even cause the formation of antibiotic resistant strains. 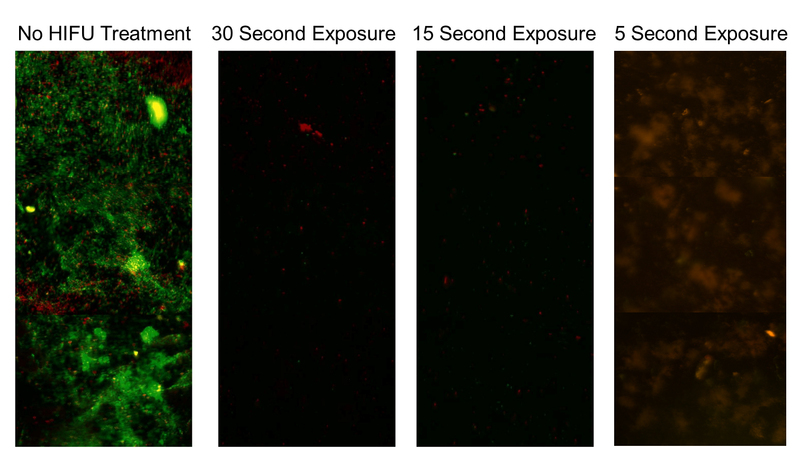 Recently, however, we have shown that focused ultrasound can precisely target and destroy these biofilms (Figure 1). Therefore, in the future, we hope to develop a noninvasive therapy to treat infections on medical implants based on ultrasound. Fig 1: The surface of graphite plates after growing Pseudomonas aeruginosa biofilms and exposing to high-intensity focused ultrasound. Green shows live cells while red shows dead cells. In the absence of treatment, a live biofilm is clearly visible. 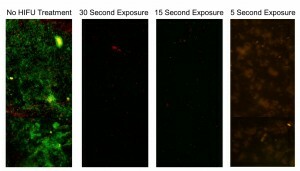 The ultrasound exposures resulted in almost complete biofilm destruction with few if any live cells remaining. There are two primary types of therapy that can be performed with ultrasound. The first uses the energy in the sound to heat the tissue. The second uses the sound to excite microscopic bubbles in the tissue resulting in a mechanical change to the tissue structure. Our technology is based on the generation and subsequent excitation of the microscopic bubbles. The high-intensity of the sound causes the bubbles to violently collapse shredding cells adjacent to the bubbles. In addition to treating biofilm infections, we have also shown that the excitation of these microscopic bubbles can lyse microalgae for the release of lipids. These lipids can then be utilized in the formation of biofuels. The use of focused ultrasound was shown to be more energy efficient than other comparable methods of lysing the microalgae.